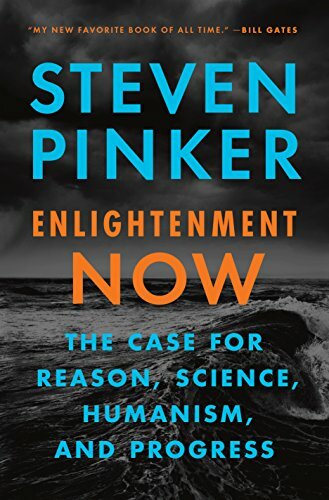 Enlightenment Now: The Case for Reason, Science, Humanism, and Progress is Steven Pinker‘s masterpiece. If you choose just one of his books to read, this is the one. He takes an optimistic view of the current political and social upheavals plaguing our world and puts them in context with both recent and ancient history. In his perfect-pitch prose, Pinker makes the case that although many people decry the times in which we live, he disagrees, in essence saying, “let the good times roll.“ He doesn’t think we’re nearing the end of The Enlightenment, either — he thinks it’s a set of ideas and a way of reasoning that can and should be renewed with each successive generation. He cites numerous statistics showing how people are richer, wealthier, and live longer than any other time in history. There are hundreds of examples that give ample reason for optimism as we navigate this era of confusion and frustration in U.S. and world politics. Enlightenment Now is a long and dense book, but be sure to read it all the way to the end, because all through this masterful narrative of our society, there are some of the most profound paragraphs, pages and chapters I’ve ever read. This is one of my favorite books of all time, perhaps my most favorite. I need a long time to think about and sort out all the ideas in this book. After spending the past month reading and studying it, it’s become clear to me that I need to adjust my point of view on many issues. One thing is certain: I will carry with me the ideas, concepts, and most importantly, the way of thinking that I’ve learned in Enlightenment Now for the rest of my life.